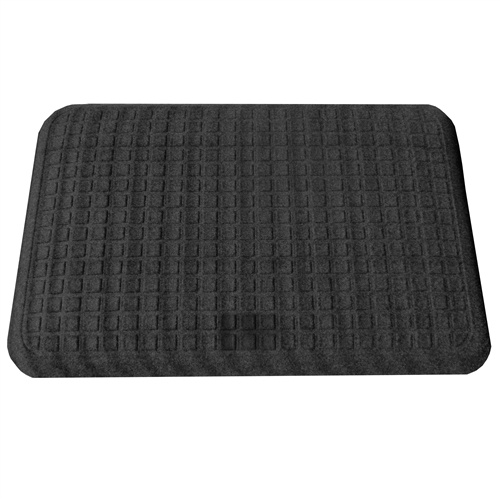 Premium Sit and Stand Smart Mat measures 22" x 32" and is a unique rubber compound that is a cushiony 5/8" thick. It is made of a highly durable solution dyed polypropylene which will not rot or fade. The backing is 100% nitrile rubber. The cushion is a closed cell nitrile cushion permanently molded to the nitrile rubber surface. The Premium Smart Mat is an extremely high quality anti-fatigue mat that will retain it's compression, color and function for many years. 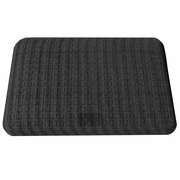 The Smart Mat allows you to easily slide the mat with your foot when pressing down on the center of it. The mat will stay in place and won't slide when you are standing on it. This allows you to retrieve the mat, or slide it out of the way with little effort. Clean with Water, Spray, Vacuum etc.